If you’re tired of eating the same old thing and hosting the same old party, it’s time to seek out an alternative: fresh and local farm-to-table cuisine. Besides being a current trend, eating local is also a great way to get the freshest food and support your local businesses in the process. Do you enjoy hosting parties and want others to share in the goodness of eating local? Here are some tips on how to host your own farm-to-table patio party. The great thing about eating locally grown food is that you get to eat it when it’s the most fresh. Plan a menu that accentuates the taste and flavors of fruits and vegetables that are in season. Make the most out your produce by using all of it; root to tip. Although the produce will take center stage, let other local fare add some diversity. Local honey can glaze farm raised salmon. Grass fed beef can make for a great main course dressed to your liking. A fruit salad parfait will make good use out of local strawberry jam. Get the most out of your local finds with a soup, salad, entree, and dessert on your patio party menu. Set the mood of your farm-to-table patio party with the great outdoors in mind. Schedule the party at the time of day when the sun will soon be setting to highlight the beauty in the sky. Have extra lighting like candles on hand as the party drifts on into the evening. The focal point of your table can be a simple assortment of flowers dressed up with feathers or wheat. Serve drinks out of mason jars. You don’t need elaborate tableware to impress your guests. Remember, this party is all about the food, not the decor. Although paying attention to detail will make the finished product more profound, don’t sweat the small stuff. A minimalist attitude for this kind of patio party can go a long way. If you have a pergola cover over your outdoor oasis, consider wrapping the beams with lights or hanging decorative lanterns for added ambience. Your farm-to-table patio party needs to be relaxed and enjoyable. The great thing about this get-together is that you don’t need a long list of ways to keep guests entertained. Let the food be the conversation piece throughout the dinner. All you need is good food, good friends, and the good times will make themselves. Send your guests off with a little party favor of local baked goods or preserves as a reminder of the wonderful time you had together. Is your outdoor space lacking warmth and character? 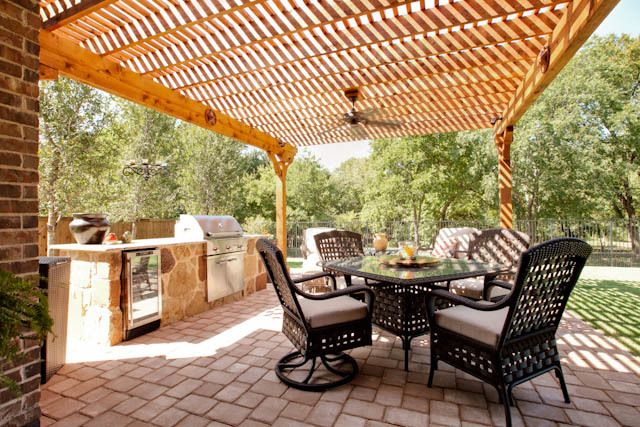 Click here to request an estimate so you can start planning your own patio party.